As part of my home decluttering project (OK, it was my 2016 New Year’s resolution, but who says it can’t continue in 2017?) I recently took my frig from chaos to calm. 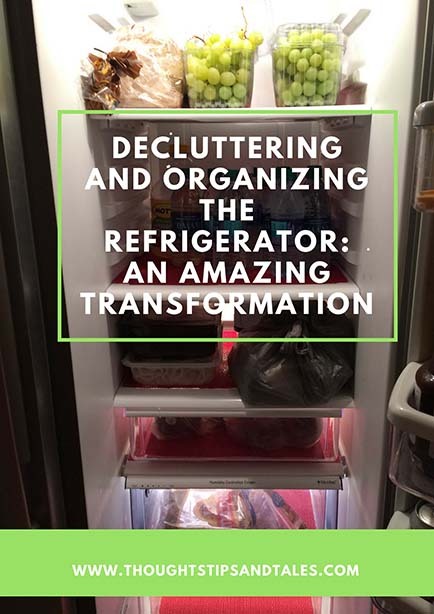 Decluttering and organizing the refrigerator resulted in an amazing transformation. It’s a chore to remove contents and scrub everything — and there’s always the chance you might drop the glass sheet and break it when it’s soapy and wet. 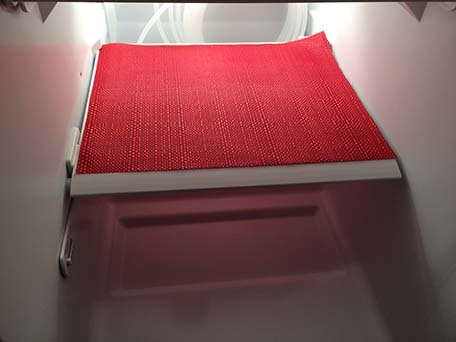 An interesting tip I read late last year suggested that covering glass shelves with washable placemats was a great solution for spills, since the liners themselves can be removed and washed without having to remove and scrub the shelves. By April, though, I snagged 7 red linen-looking placemats at Steinmart for $2.99 each and was ready to go. Unfortunately, procrastination — and life — stepped in, and I finally completed the project in June. 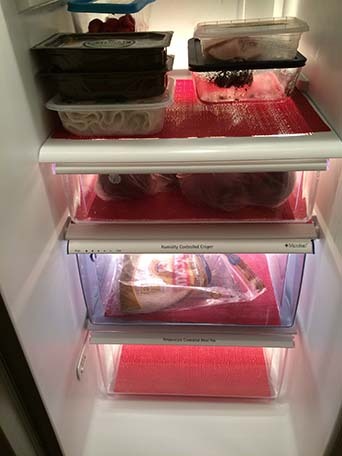 Despite the delay, the project was a huge success — and it took only an hour to remove all the shelves and wash the entire interior of the frig, then cut the mats to the correct size and position them. Doesn’t it look fabulous?! The interior is so tidy that it makes me want to place frig items in neat piles all the time now. Decluttering Kitchen Cabinets: ALL of Them at Once! This entry was posted in decluttering and tagged decluttering refrigerator, organizing refrigerator. Bookmark the permalink.